The Britax Marathon ClickTight is a stylish offering among the many players of the Britax car seat family, a high quality brand well known for excellent safety ratings. It’s a Euro-styled seat with premium features at a premium price. But it will last from birth until your child is ready for a booster seat. An impressive seat in and of itself, the Britax Marathon employs its signature ClickTight technology, which makes installation simple. This seat certainly stands out among the competition, but it can be a considerable financial investment. Whether or not it’s worth its weight in terms of price is up to you. But we’ve broken down the details so you can quickly determine if it will be the best option for your family. 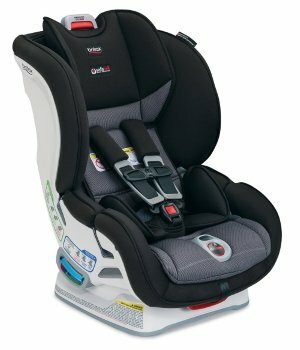 What’s so special about the Britax Marathon ClickTight (CT) convertible car seat? That’s a good question, considering that there are several similar named models in the Britax lineup. One of these, the Britax Marathon G4.1, has been discontinued. Others currently on the market are the Britax Boulevard ClickTight and the Britax Advocate ClickTight. It’s easy to get these confused, but they have different features and prices. So pay particular attention when reading online reviews to make sure you’re looking at the seat you’re interested in. One great thing about the Marathon CT is that it has no seat belt lockoffs. Since Britax first introduced lockoffs, that’s a bit surprising. But the ClickTight panel takes care of that. It actually closes down over the seat belt to lock it in place. Boom. Done. The CT system has made the LATCH system obsolete in most situations. Watch this video to get an idea of how it works before we get into the specifics. 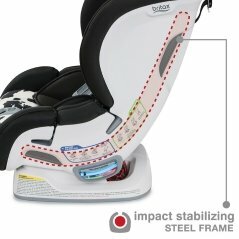 What are the child size limits for the Britax Marathon CT convertible car seat? 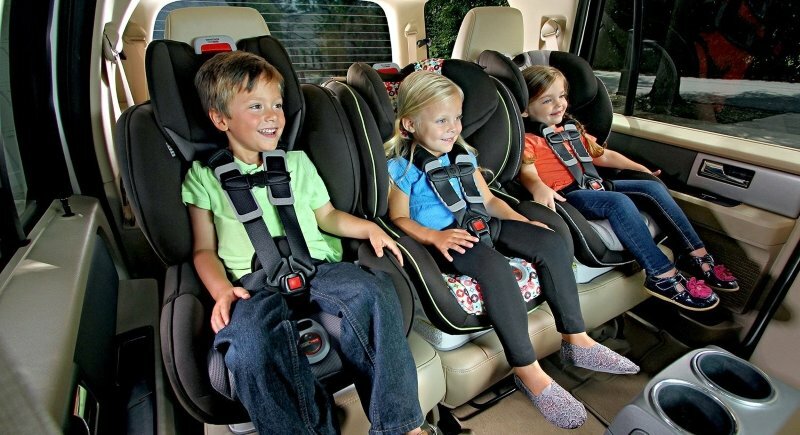 While there are 2 crotch strap/buckle positions, some parents felt the straps were way too tight on their babies’ legs. So for an older or larger baby, they may fit too tightly, but make sure you check the crotch strap position and adjust it if necessary. The rear-facing weight limit is a good 40 pounds, but you’ll have to stop using the lower LATCH at 35 pounds, which we’ll mention again below. Note: Similar Britax seats such as the Britax Boulevard CT and Advocate CT all have identical weight ranges. These seats are at least $20 – $70 more than the Marathon. 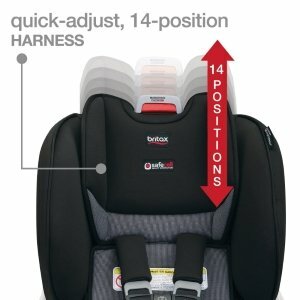 How big is the Britax Marathon CT convertible car seat and will it fit in my vehicle? If you ask a dozen parents about how the seat fits in their cars, you’ll probably get a dozen different answers. This is a fairly big seat, so it all depends on your vehicle interior size, where you want to place it, and how you want to use it. Using it with a 3-seat configuration rear-facing may be near-impossible unless you have a huge interior. For tall passengers, placing it rear-facing behind the seat may limit front leg room considerably. There’s only one way to be sure this seat will fit. Take measurements of your back seat area, including where the top of a rear-facing seat would be when the tallest passenger is in the front. Then compare to these specs. You can also call Britax to see what they recommend. Note: For the comparable Britax seats, Boulevard and Advocate, each is heavier than the Marathon at 29 and 30 pounds respectively. 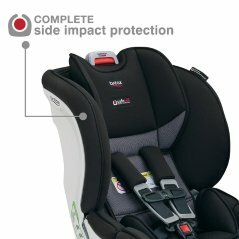 How safe is the Britax Marathon CT convertible car seat? The Marathon CT’s steel frame, though heavy, is sturdy and strong. These safety features make for an all-around safe and reliable seat: Deep side impact protection, Versa-Tether and SafeCell impact-absorbing base. 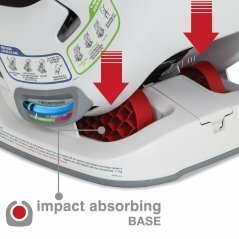 The Versa-Tether is unique in having a V-shape to minimize seat rotation and staged-release stitching that slows and reduces forward movement. This provides extra protection against head, neck and spine injuries while in forward-facing mode. Note: These seats no longer use rear-facing tethers. Instead, an anti-rebound bar is available to purchase separately from Britax. There was also a recall for some seats manufactured between August 2014 and July 2015. Major retailers should be selling only the updated models, but to be sure, double check model numbers on the Britax recall notice. New LATCH regulations have lowered the anchor weight limits, so if you’re still using LATCH on these seats, keep in mind that the LATCH weight limit is 35 pounds rear-facing. The seat’s rear-facing weight limit is 40 pounds, so you may have to stop using the LATCH before you turn them forward-facing. Possible flaws: Some parents reported not being able to adjust the straps to equal tightness. Also, crumbs and other debris can accumulate in the strap release button, so this could be a safety concern if your child often eats snacks in the car. The good news is that there are several real crash stories that prove the Marathon CT can protect your child in an accident. One family experienced a 70 mph impact into a tree, and their 13-month old son was just fine. 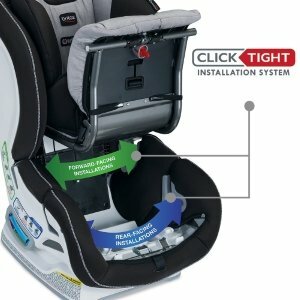 How easy is the Britax Marathon CT convertible car seat to install? This may be one of the easiest seats on the market to install, thanks to the ClickTight seat belt installation. Some parents did have difficulty getting the seat belt tight enough or felt the CT release button was too hard to turn. Most parents, however, had no issues installing. All it takes is pushing then turning one button to lift the seat panel, then you thread the seat belt through the simple belt path. Make sure to pull the slack out of the lap belt and make sure both belts are lying flat, then close the panel. If the seat moves around more than one inch on either side, try removing more slack from the seat belt. Note: The Marathon CT cannot be installed with the inflatable seat belts now found in some airplane seats and in some new Mercedes, Ford, and Lincoln models. Possible flaws: Some parents reported the seat padding became loose after uninstalling and reinstalling the seat. The padding got in the way so it was more difficult to close the CT seat panel. Other parents said the recline handle jammed so they couldn’t get the seat to recline properly. Tired of getting indentations in your vehicle seat from the car seat base? Try this sturdy, no slip, waterproof seat protect under your Britax car seat. The raised edges keep spills contained while the front guard protects your vehicle seat from dirty shoes. Protects against rearward movement during front or rear impacts. It’s soft and padded to provide a nice foot rest for your child. For use with any rear-facing Britax CT convertible seat. If safety is your primary concern, the Britax Marathon ClickTight is a really great choice. It’s been proven to work in real crash situations, not just in a lab, which holds a lot more weight in our opinion. As far as price, it’s the cheapest of its cousins, the Boulevard and Advocate, but is still a pretty big investment. The most questionable concern to us is whether it will fit well in most vehicles. Reports vary widely about that. So we highly recommend you measure your back seat dimensions prior to purchasing or call Britax to see if your vehicle is compatible. Installation proved to be difficult for only a small percentage of parents, so the Marathon CT ranks really high on our ease of use scale. The ClickTight system makes seat belt installation a breeze and works just fine without a rear LATCH. That alone should make parents rejoice. All in all, we consider the Britax Marathon ClickTight convertible car seat to be a great option for your child. It’s worth the investment, though of course, individual seats and experiences may vary. Always thoroughly inspect every part of a car seat before you use it. If anything at all doesn’t work, call Britax immediately. They can’t fix recurring issues if they aren’t made aware of them. ❮ Is the Chicco Viaro Stroller Travel System a good choice for your family? Find out in our detailed review.